Solar photovoltaic (PV), concentrated photovoltaic and concentrated solar power (CSP) technologies are a global trend in building a cleaner and brighter future. It is estimated that the entire human population of the earth uses almost 117.3 terawatt hours of energy in average per year. The sun is capable of producing more energy than what is being consumed by humans by a factor of 20,000 times. However, all this energy is not directly available and has to be converted to usable energy. 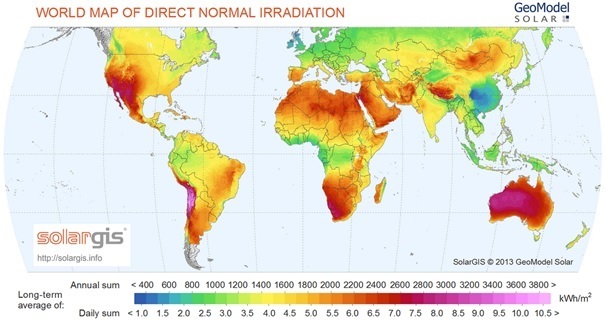 The radiation that reaches the earth’s surface is represented in different ways, namely, global horizontal irradiance (GHI) and direct normal irradiance (DNI). 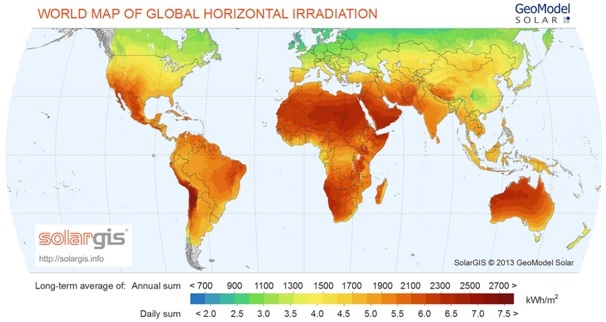 GHI is the total amount of solar irradiation from the sky that is received by a surface horizontal to the ground, independently of its direction. Normal PV technologies have been optimized to capture global irradiance, combining diffuse radiation (e.g. scattered through clouds) as well as direct normal irradiance. DNI on the other hand, is irradiance that is received by an area that is always held perpendicular to the sunrays incoming directly from the suns position in the sky. The utilisation of DNI is in the interest of concentrating technologies such as CPV and CSP which need to be tracking the sun throughout the day. The behaviour of GHI and DNI vary based on geographical locations on earth. Normally GHI is copious in areas below latitudes of 45°N and areas particularly near the equator such as the Sahara, Australia and Saudi Arabia as shown in Figure 1. DNI on the other hand has high presence in sub tropic regions normally around latitudes of 23°N and 23°S ±10°. Global areas such as Chile, North Western Australia, Northern Mexico, South Africa and pockets of sub-saharan Africa receive high amounts of DNI. The altitude of particular areas of the planet can also affect the usable irradiance available in a per unit area. Countries such as Chile and the Himalayan region, receive abundant amounts of DNI as a result of their high altitudes. At high altitudes, the sun’s rays require less distance to reach a given landmass and therefore atmospheric absorption and scattering is kept at a minimum. Pollution negatively impacts the total available solar irradiance of a given area. Places such as eastern China, as seen in Figure 2, receive the least amount of solar irradiation as a result of heavily pollution and increased humidity produced. This makes it very difficult for the sun’s rays to reach the earth’s surface due to the dense smog absorbing the available irradiance supplied from the sun. Temperature and dirt factors derate the conversion efficiency of the solar plant equipment. Imagine installing a solar plant in areas such as Sub-Saharan Africa or Saudi Arabia that is surrounded by sand and extreme ambient weather conditions. The sand in some cases will cover the collector surface of the plant and the scorching temperatures may damage the electronic equipment required to convert the power being generated. The population in a given area will heavily influence the feasibility of installing a utility scale plant. Building utility scale solar plants requires a large area that is ideally clear of natural habitat and manmade structures to avoid shading and pollution. From these considerations Chile could be among the ideal candidates for building CSP, CPV or PV utility scale plants. It is rich in GHI and DNI solar irradiance and has comfortable temperatures for electronic equipment to perform optimally. However, some of these areas may be too remote to population and therefore the grid connection may become too costly. Overall, the trend in building a cleaner and brighter future for our planet will depend on the our success in harnessing the suns solar energy with CSP, CPV and PV utility scale plants. At Sustainable Solar Services we are able to provide in depth analysis of potential solar sites worldwide. For more information please contact us. ← Why tier 1 panels?